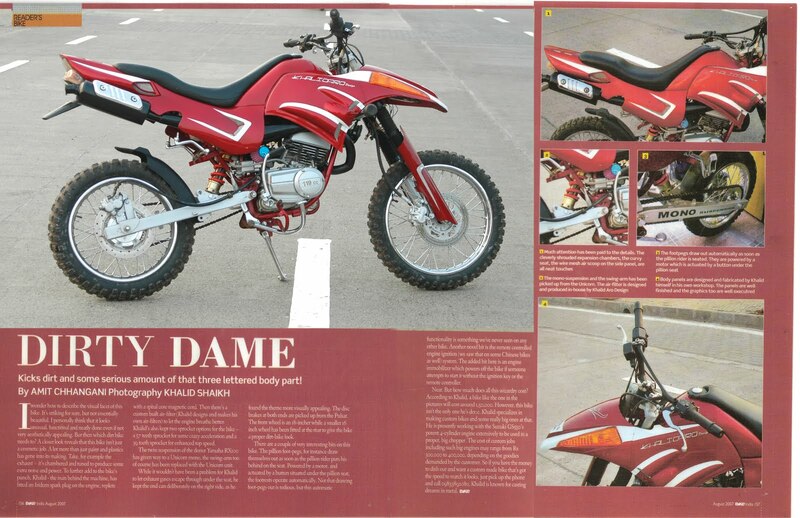 Fast and good looking bikes are the universal heartthrobs; almost everybody gets infatuated to them. Probably this is the main reason which has given birth to the concept of modifying the bikes, bike modification allows you to get the custom look, as per your choice you can modify it for almost everything, sometimes even the engine as well. Khalid Shaikh is the owner of a Bike and Car designing company, Khalidaro Design, located in Mumbai. I recently came to know about Khalid and had a couple of conversations with him over the phone, trust me, the way he talks about his work sounds amazing, you can feel the passion in his talks, he addresses his creations as ‘Babe’. It’s like you just need to initiate talking about bikes and car designs, and later just keep responding in simple ‘hmm’ and ‘that’s great’ like words. 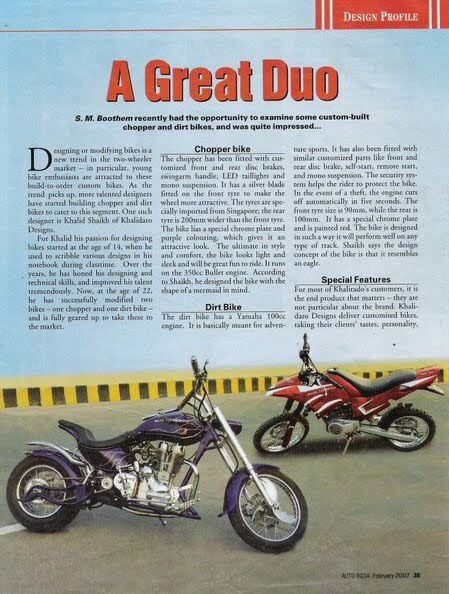 Both these designs of Khalidaro Design were featured in Bike India and Auto India, the snapshots for the same can be seen here and here. The company has also done some bike theme based designs, like Scorpion King and Batman, shown below are the photos of these theme based designs. Designing Cars and Helmets is also done by Khalidaro Design, and they have done some professional designing for some helmet companies too. Another thing which is very remarkable is, Khalid says – “I do most of the jobs during the modification process on my own, hardly outsource.” Interesting enough, isn’t it? So, if you are looking for some bike, car or even Helmet designing company, you search ends at Khalidaro Design, you can get all the details to contact them on the official website of Khalidaro Design. They offer the modification options for both old and new bikes as well. hi, mine is a pulsar 150, 2005 model. i want to modify it into a chopper please quote. hey khalid bhai salam alaikum i want to learn something about choppers bcoz i hve my bike wrkshop so plz call me on dis no.9821665300 my name is mohammad khan. And Yes How Much The Blue Khalidaro chopper cost? Well i want to get somethin written in my helmate in metal… where can i get it done??? @Rahul Khalid does that, you can contact him. HI .im based in mumbai and have recently purchased the Avenger 220 cc. was looking forward to get a pint job done . would appreciate if you could share the contact for the same . @Nitin:- As the chassis of a pulsar is been designed on a street bike concept…it will cost you more as compared to a avenger or bullet…yes but it is possible… thanks. @Shashwat:- Thats a rx 100 modified with a front and rear disc breaks,mono suspention,front complete assembly original imported will cost you 95000 with the bike and engine fully ported…thanks. @Mohammad khan:- Walekumassalam bhai i have students doing interns at my place, any time with an appointment you can come down to my work skop…thanks. @Dr Subhransu:- My work shop is at juhu versova link road opp banana leaf restaurant, bharat nagar society, shop no 89, khalidaro design. our budget starts from 80000 to 500000 for more info call 9833892080…thanks. @Rahul Sarda:- Ya rahul we do metal embossing and engraving…also we can give you cnc font… thanks. @Aamar sherlekar:- Classic 500 is a good bike to modify if you have taken the delivery you can customize it or else i have a master piece for sale… will get to see at my work shop…thanks. @Alvin Rodrigues:- Yes we do custom painting and airbrushing under the name of sonic customs…our pricing for avenger starts from 5000 to 50000,, for all kind of jobs we use only dupont 3050 paints and clear coats…thanks. Include the cost of the bike or just the Mods? Wanted to know if any modification can be done to Hero impulse…. Please email me if you have modified Impulse and do send me pics along with your shop’s address..
Assalam waalekum khalid bhai mere naam tahir Ansari hai mujhe yeh pata karna hai ke kya aaplog sports bike main modify karte hai ek normal bike ko aur karte hai toh kaunsi bike ko. Salaam Khalid bhai – Ur work is superb !! My query is different from others but I am hopeful you wud give a solution. I m a handicap (polio in right leg) … Since last 4 years I am riding activa with side wheels and have take it for long rides….I am an adventure person….however dont wish to exploite activa any more so planning to buy avenger and side wheels will be done by COZI. But the problem is leg controls I.e gear and foot break. Can these foot controls be modified / altered to hand controls? I have an RX100 which is very dear to me and I intend to do something special to it. Your designs have me intrigued. Could you please be kind as to let me know if your team would be interested in turning my black beauty into a work of art. Hey khalid I hav a karizmr zmr .I want to incrse d bhp and modify my side pannels of d bike wich is a obstacle to reach d top speed. How much it will cost me to modify a pulsar dtsi to a hyabusa or other sport bike. Please reply or call me on 8082046142. Hello sir, i want tomodified my CD100 Bike so please give me your number or address or contact me.. My number is 7048212162. HI Khalid, I am Sanjay from Mulund. I own Hyosung Aquila Gv250 black and red colour. I want to modify it to something very different and unique yet very comfortable to drive. How to go about it as I do not have anything specific in mind? I have a 1974 Yezdi and want to design it for a smooth and comfy ride in Mumbai. I am from ahmedabad want to make few changes to 2005 Honda Unicorn like Led Head Lamp, frot Suspension setup, Rear Fenders replacement with metal one and minimalist tail lamp. Love to hear from you. hello…I’m Hemal from A’bad, i have old TVS Suzuki Max R 100 original working but bad in looks….i want to refurbish it…and also do some modifications in wheels, jumpers, body work bit…i want to have detailing in all these modifications….when can i get an appointment or if possible i can send some of pics of my bike….can you send me your email of whatsapp number? 220 को हायाबुसा का लुक दिया जायेगा !!! I have an Avenger 220 and need to upgrade my engine performance. How much would it cost to increase and make my Touch top speed between 140-150.